Are two good-looking people who love each other enough to have sustainable marriage? If not, what more does it take for a marriage to stand the test of time? CNN Reliable Sources host Brian Stelter's exemplary married life, if viewed with appropriate lenses, has answers to these heavy questions. Brian Stelter is a man of many bio-TV host, correspondent, writer, and activist. He is a senior media correspondent at CNN, a media reporter, host of Reliable Sources and the author of New York Times bestselling book Top of the Morning. The CNN Reliable Sources host was named Forbes' 30 under 30: Media for three consecutive years from 2012 to 2014, acknowledging his burgeoning fame and career as a journalist. Brian was born on 3 September 1985 in Damascus, Maryland. His parents were Donna and Mark Stelter. He studied at Damascus High School and Towson University and graduated with a degree in mass communication. What is Brian Stelter's Salary At CNN? It won’t be wrong to say that Brian Stelter was a prodigy as a journalist. As early as 2004, when he was only a freshman at Towson University, he was running a blog called TVNewser, covering the news of the Television News Industry. Immediately after graduating from the university he joined The New York Times. In 2013, he published his best selling book ‘Top of the Morning’ which outlined the long rivalry between NBC’s ‘Today’ and ABC’s ‘Good Morning America’, two of the most-watched morning shows. The 34 years old journalist is currently on the books of CNN, working as the host of CNN's Reliable Sources, covering various media trends and media personalities in the industry since he joined in 2013. Interesting: CBS’s Mark Knoller Biography: From Wife Details To Tracking Trump In His List! His works with CNN earns him a salary of over $100 thousand each year. On 19 November 2017, Sean Hannity of Fox News accused Brian of supporting and giving a platform to a supposedly "racist", "bigot" and "homophobic" Angelo Carusone. The feud started when Carusone, who is a gay himself with a Jewish husband, started an ad-boycott campaign against Hannity's show. Hanitty, finding that the platform CNN provided to Carusone could undermine his show, lashed out against the gay Carusone, Brian, and CNN as a whole. Brian Stelter found the most adorable traffic News reporter, Jamie Stelter (nee Shupack), as his life partner. The couple had a typical Jewish wedding under the Chuppah. Stelter having been brought up in a family United Methodist tradition, does not have a particular religious belief. To be that uncompromising, it takes someone immensely understanding with an unparalleled love for their partners. Religion was not the only issue that seemed to have impacted their life as Stelter and his wife faced graver issue plaguing their personal lives. They survived a turbulent stint in the middle: two miscarriages and fertility issues. However, the duo persevered through the ordeal and came out stronger to be finally blessed with a beautiful baby, a daughter they named Sunny--a warmth after the bitter winter of struggles. 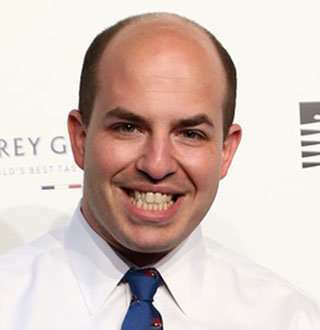 It is a cynic's job to vocalize the truth that no one can ever achieve the perfection, but it is an optimist's job to speak out that there are peoples like Brian Stelter who have reached as close to perfection as can be reached in one's personal life. All thanks to Brian and his wife's qualities-- the perfect ingredients for an ideal marriage.